Use this to place labels on your Control screens. Note that you can link this control to any battery-powered device; doing so will display the device’s battery level. Controls: Switches and Dimmers (and certain thermostats). Use this to turn stuff on and off. When linked to a dimming device, this control will toggle the dimmer between 0% and 100%. You may notice other devices with some sort of On/Off function that can be linked to this control. Ring (default): Displays a ring which can be dragged clockwise or counterclockwise to increase / decrease the light level. Buttons: Displays Up / Down buttons to increase / decrease the light level in 10% increments. Slider: Displays a Slider control as can be found in many other apps; simply drag the slider pip to the desired dim level. Tapping the control will run the corresponding scene on your Vera. Controls: Smoke / flood / motion detectors, alarm zones, any binary sensor. This control shows the state of a binary sensor. When the sensor is tripped, the color of the ring will change. For devices that support arming / disarming, this control can show and change the armed state of the device. Controls: Thermostats / Thermometers, light sensors, humidity sensors, anything that reports a numeric measurement. This control displayed a measured value such as the current temperature read from a thermostat or sensor. This can be used to change a thermostat’s temperature setpoint. Note that most thermostats will not react instantly to a change of the setpoint; they will wake up periodically, and only then receive the new setpoint from Vera. Temperature (the default): this sets either the heating or cooling setpoint, depending on wether your HVAC system is heating or cooling. Displays “Off” when your HVAC system is idle. Ring (default): Displays a ring which can be dragged clockwise or counterclockwise to increase / decrease the temperature. Buttons: Displays Up / Down buttons to increase / decrease the temperature setpoint in 1 degree increments. Slider: Displays a Slider control as can be found in many other apps; simply drag the slider pip to the desired temperature. 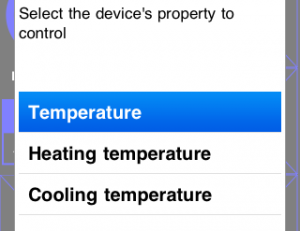 If your thermostat supports settings like heating or fan mode, you can manage these using this control. In the control’s properties screen, you can select which aspect of your thermostat to control: eco mode, heating/cooling, and fan mode. Buttons: Simply presents the available options as individual (mini) buttons. Rose: Presents the available options in a “rose” of buttons that appear around the control when tapped. Tapping the control will bring up a full screen view of the camera, along with controls to pan, zoom and move to a preset position. These controls can be hidden in the control’s properties, in case your camera does not support any of these operations. This control shows the states of your lock (locked / unlocked). Tapping the control will open or close the lock. Suggestion: change this control to ask for confirmation or even a PIN before toggling the lock, to prevent inadvertedly opening your home. This control displays up to three values from any device. The values can be chosen from anything that the device reports. For example: use this to read power consumption from a power meter. Most values are displayed exactly as reported by Vera, but some are translated and displayed with the appropriate unit: time/date, temperature, humidity, light levels, power drain and power consumption. Clicking one of the 6 buttons will select the corresponding color preset. This control will show the alarm and armed states of an alarm section. It also allows you to control the alarm section’s state, by tapping the control. The selection of available armed states can be reduced in the control’s property screen. If your alarm system requires Vera to provide a PIN in order to accept commands from it, you can provide this PIN in the control’s properties. For your security, this PIN is stored in an encrypted state (as is the entire configuration), and you can change the control to only work after the user supplies the PIN for HomeWave. Controls: Window coverings: curtains, blinds, roller shutters. This control provides an up/down button; these will start the window covering to move in the corresponding directing. Tapping the label in between the up/down buttons will cause the motor to stop. Note that you can also use a Dimmer control for window coverings, this will let you move the curtain or blind to an exact position as indicated by the dimmer (if your blind controller supports this). Controls: Navigation, arbitrary URLs or arbitrary Vera services. When clicked, HomeWave will go to the configured control screen. Use this to easily switch from one screen to another. When clicked, HomeWave will switch to the previous or next screen, or the Home screen. Function is identical to the small previous/next/home buttons in the app’s status bar at the top of the screen. – to control other devices on your LAN or the INternet that respond to URL GET commands. – any parameters required by the action. Most of the items in the control properties screen are fairly obvious. The following section explains a few of the less obvious ones. With this property you can add or change the text displayed below a control’s name, depending on the state of the control (on, of, tripped, etc). For example, a smoke detector will show Ok when idle, and Tripped when smoke is detected. Those labels are defined in these properties. You can also add such labels to on/off switches and door locks. Change this property if you wish the current dim level to be displayed at all times in a dimmer control. This property is on by default in Thermostats. The dim level is displayed by default when dimming a light up or down. This can be turned off with this property. Some devices (most notably: thermostats) have multiple variables that can be manipulated. If this is the case, the “Controlling:” property will show up in the property for that device. Clicking it will allow you to change the variable that i being controlled. For example: some thermostats have both a heating and cooling setpoint. To control both, add 2 thermostat controls, both linked to the same thermostat device. Then change the Controlling: property for one control to “Heat setpoint” and for the other control to “Cool setpoint”.